OAK 311 has received this issue. Your service request ID is #895520. Please check back for status updates, or contact us directly at 510-615-5566. OAK 311 has received this issue. Your service request ID is #896501. Please check back for status updates, or contact us directly at 510-615-5566. Why bother reporting this....the city has major problems to deal with that are public safety issues. This is minor. Now blocking the words that say "traffic fine doubled." Many more stickers on reverse side. The City of Oakland Public Works Agency has received this issue. It is registered as service request # 445540. Please check back for status updates or contact us directly at (510) 615-5566. City of Oakland Public Works Agency addressed this issue on 02/15/2013, service request # 445540. Someone's lying again - the signs are UNTOUCHED and still UNREADABLE, nearly covered with stickers. Finally! But why does it take multiple tries to get it right? The City of Oakland Public Works Department has received this issue. It is registered as service request #635991. Please check back for status updates, or contact us directly at 510-615-5566. City of Oakland Public Works Department addressed this issue on 03/09/2016, service request #635991. "City of Oakland Public Works Department flagrantly lied about having addressed this issue on 03/09/2016, service request #635991." The City of Oakland Public Works Department has received this issue. It is registered as service request #640379. Please check back for status updates, or contact us directly at 510-615-5566. OAK 311 has received this issue. Your service request ID is #897218. Please check back for status updates, or contact us directly at 510-615-5566. Got buzzed by a Subaru Outback plate # 6CNL030 this morning. When caught at the light I was told that "cyclists don't belong on the roads". Why has OAKDOT not built bike lanes that actually connect here? The bike lane -> sharrow mixing zone -> bike lane again pattern is incredibly dangerous as motorists do not slow down and feel entitled to the lane. Pic provided to show how this motorist was less than a foot away when passing at high speed. OAK 311 has received this issue. Your service request ID is #845448. Please check back for status updates, or contact us directly at 510-615-5566. The main reason why I avoid biking on Broadway is specifically because of that bike lane gap between W MacArthur and 40th, as car and bus drivers are extremely impatient with bikes through that short section despite the nice bike lanes to the north and mediocre ones to the south. I've been asking city staff for a fix since 2013, but the answer is consistently that they are waiting for the Kaiser development at the NE corner of Broadway/W MacArthur to happen, which will reconfigure the roadway to make space for bike lanes without the need to convert a travel lane or parking aisle. I agree that this compromise isn't acceptable, and the interim solution should be to convert the travel lane or parking until the development is complete, and not continue putting bike riders at risk for however many additional years it will take to finish the hospital project. 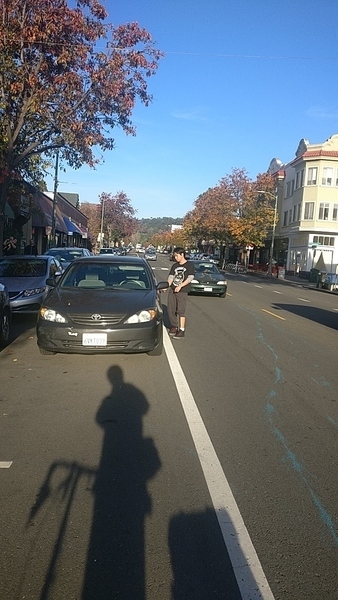 This Uber driver was parked in front of 4315 Piedmont Ave, Oakland, CA, delivering a meal. The opposite side of the street had a linen truck parked in bike lane. This is a constant problem on Piedmont Ave. I can rarely travel more than 2 blocks without a vehicle parked in bike lane. I suggest issuing warnings for 3 months, then start issuing tickets. Should double parked cars park in vehicle lane instead? OAK 311 has received this issue. Your service request ID is #859460. Please check back for status updates, or contact us directly at 510-615-5566. A couple of hours later, another restaurant delivery parked in bike lane. This driver started honking at me when I was stopped at Linda waiting to make a left turn. *I* was legal. The City of Oakland addressed this issue on 12/13/2018, service request #859460. How did the city address the problem. Are they currently enforcing parking regulations. Since I don't see an answer, I'll reopen the ticket. OAK 311 has received this issue. Your service request ID is #896240. Please check back for status updates, or contact us directly at 510-615-5566. The City of Oakland addressed this issue on 04/19/2019, service request #896240.